This is a very nice vacuum. The strength of the power brush head is excellent, picking up a shocking amount of dirt the first time I used it. It is amazing how much the house feels cleaner now with this vacuum since I replaced my Hoover upright. The only downside I have is that the hose is not as flexible as I would have liked for a canister vacuum, but that is a pretty minor complaint overall. Vento meaning wind in Italian was the inspiration of the MR-500 Vento Canister Vacuum System. The team at Vapamore spent 2 years developing the ultimate canister vacuum with features that meet and surpass competitors vacuums selling for more than twice the price. 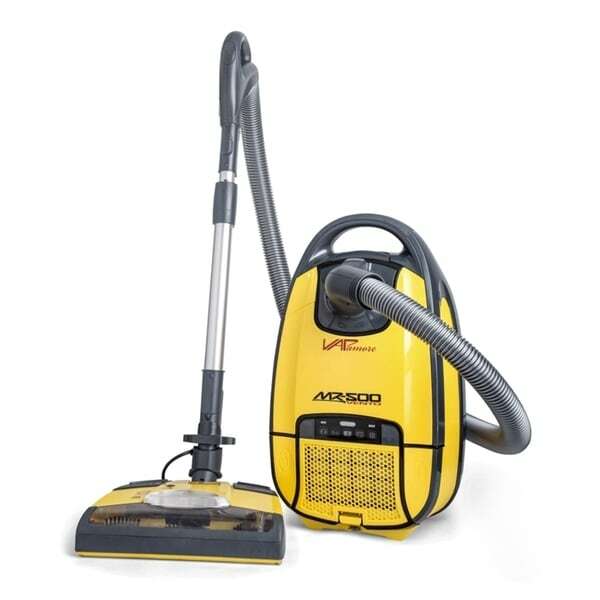 Vento features include 1400 watts total cleaning power, adjustable suction controls, electric rotating brush, extra large floor head with bright LED lighting, ultra tight turn radius, quiet efficient operation, 26' retractable power cord, on board tool storage, and the largest selection of included accessories. The Vento's HEPA filter helps to maintain clean, contaminant and allergy free air. This vacuum cleans up to 99.97 percent free from pollen, dust mites, pet dander, mold, and all other allergens. This product offers quality and power. Love the vacuum, has great power and cleans well. Love how the cord goes inside the canister instead of wrapping around. The sweeper works very nicely; I am just not crazy about the idea of having to order the sweeper bags for it. "Is this vacuum really 26 pounds, on another site it says 15 pounds?" Because it has the power I wanted and it was within my price range. Hello cagreen7, the country of origin is China. Please let us know if you have additional questions. Thanks for shopping with us.